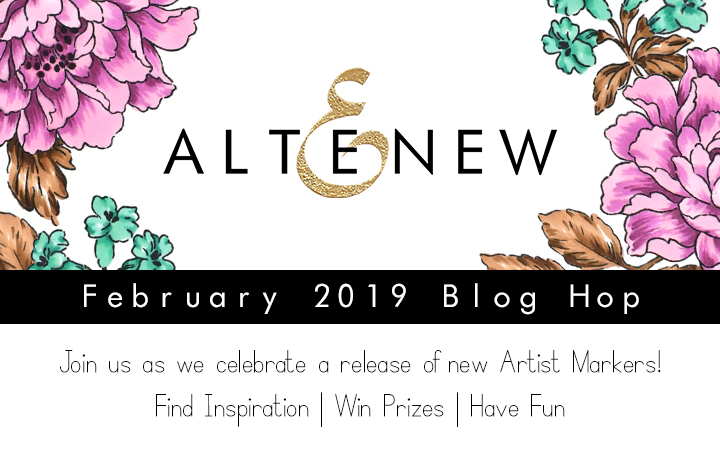 Hello and welcome to Altenew Artist Markers Set D Release Blog Hop!!! Are you enjoying the blog hop :) ? If you are coming from Svitlana Shayevich's blog, you are right on track! If you're lost on the way, please hop over to Altenew Card blog to start over! I'm so excited about the new addition of Altenew Artist Markers in my favorite colors! 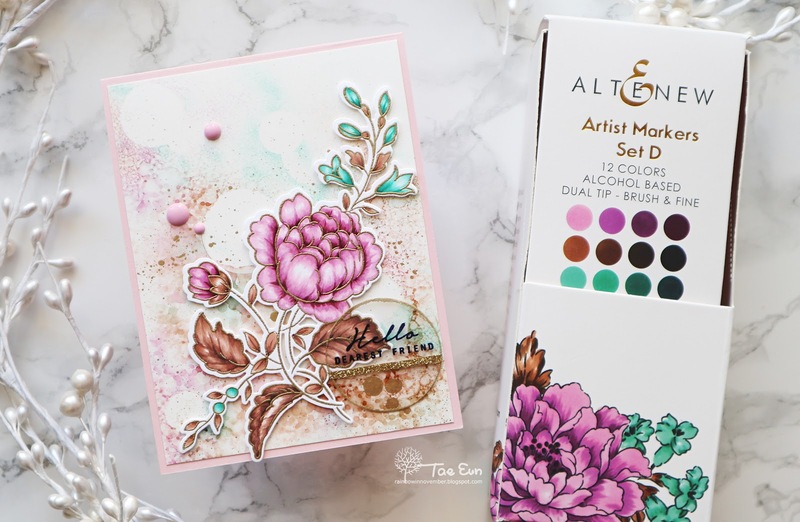 The set D contains the coordinating colors of Rose Petal, Coffee Break and Sea Shore ink sets by Altenew. The markers of Altenew Artist Markers set D are as always super easy to blend and you have already the right color gradation to color with! I've created two cards using Artist Markers Set D and Handpicked Bouquet stamp set. 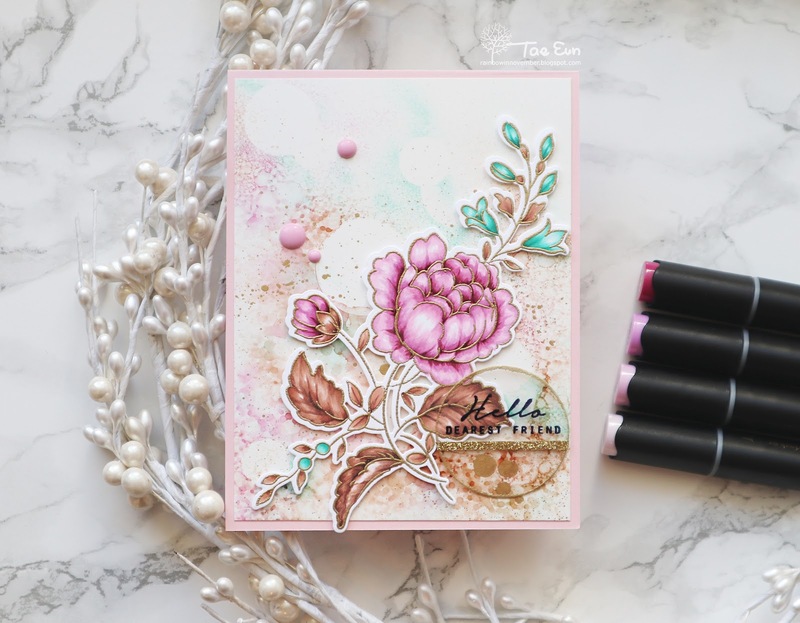 On my first card I colored the beautiful floral cluster from Handpicked Bouquet stamp set using only Artist Markers Set D and created the background also using the same markers. I stamped the floral cluster image in a gray alcohol marker safe ink on a Neenah solar white cardstock and colored it using Artist Markers Set D. I used all 12 colors on my image. After done with coloring I cut it using the coordinating die. On the background I decided to use Tim Holtz Distress Marker Spritzer and some circle acetate pieces in different sizes to create a bokeh effect. First I placed the circle acetate pieces on a Yupo paper panel and spritzed R601, R603, B802, Y911 and Y821 on it. I sprayed rubbing alcohol on the panel and let it dry. I then added some small circle acetate masks and spritzed the markers and rubbing alcohol again. I removed the circle masks and let it dry. After the second layer was dry I splattered Gold Mixative on it to add some golden accent. I narrowed down the Yupo panel and glued it on a soft pink cardbase. I then foam mounted the colored floral image on it. For the sentiment, also from Handpicked Bouquet stamp set, I used a circle clear acetate. I stamped the sentiment in an embossing ink and heat embossed it in black. I applied the embossing ink also on the edge of the circle and gold heat embossed. I added a thin strip of gold glitter tape from New Day Card kit on the acetate. I foam mounted it by adhering the foam adhesive on the back of the acetate where the glitter tape is adhered. To finish off the card I added three pink enamel dots from New Day Card kit . 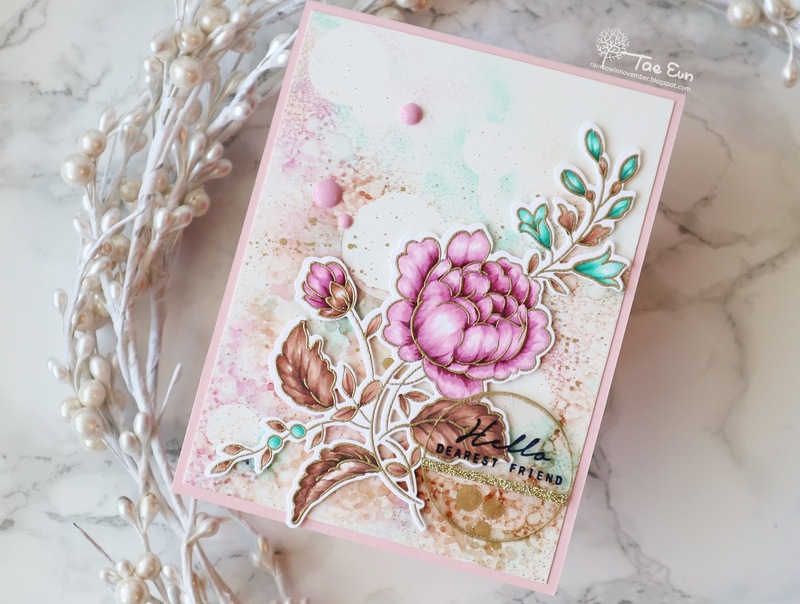 On the second card I did a background stamping using Handpicked Bouquet stamp set. To create this card I first made some stamped background samples. I picked one from them and used it as my guide for coloring. My plan was to create a doodled look. So I added colors first on the glossy cardstock and then gold heat embossed the image. I scribbled Rose Petal colors (R series from the Artist Markers Set D) on the spots of the glossy cardstock panel where the flowers would be placed. I then added some green tone (G804, G935 from Artist Markers Set E) and the blue colors from Artist Markers Set D. I sprayed lots of rubbing alcohol on the whole panel to blend the colors. It softened the harsh strokes of the markers. I gold heat embossed the Handpicked Bouquet image four times as shown in the picture. I masked the image and splattered Gold Mixative on the panel. While the panel was drying I cut the sentiment. 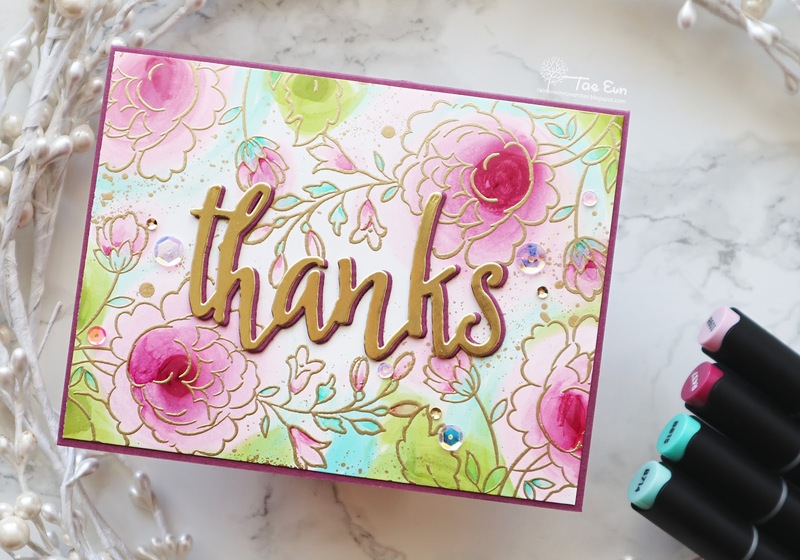 The Thanks die was cut once from a gold cardstock from New Day Card kit and three times from Mulberry cardstock. I stacked them together, the gold die cut slightly offset, and adhered it onto the card. I used the same Mulberry cardstock as the cardbase. I finished off the card by scattering some pretty sequins in pink tone. That was my two cards I created to showcase the new Altenew Artist Markers set D! Hope you enjoyed looking my projects! 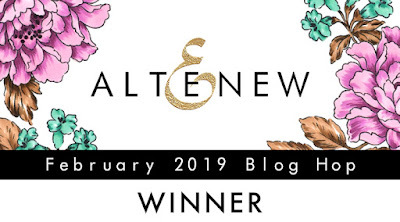 I will also randomly choose a winner from comments left on this post by Tuesday 2/12/19 at 11:59pm EDT, who will win a $30 gift certificate to Altenew online store. The winner will be announced on this post on Wednesday 2/13/19. Thank you so much for your lovely comments, everyone !!! 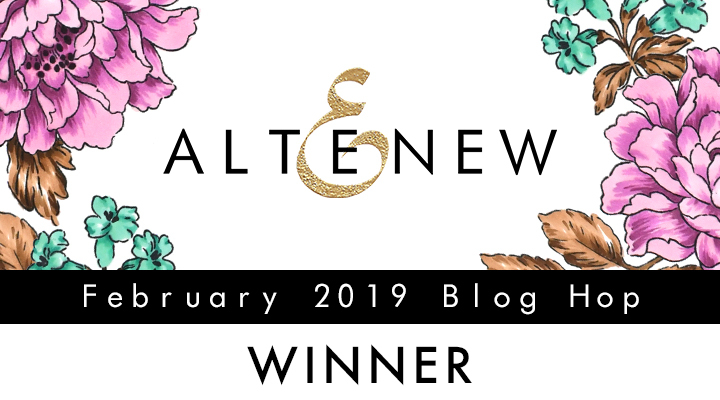 by 2/28/2019 with the subject line Altenew 2/7/2019 Release Blog Hop Winner from TaeEun's Blog. Your next stop on the hop is Kossakovskaya Anna' s blog! Below is the complete list of this blog hop! TaeEun Yoo --> You are here :)! Wowza! I love the soft look of your cards! They are just so Beautiful! Love the new colors and your cards. The Thanks card is stunning! It should be framed! All of these are so pretty! But I loved reading how you achieved your "bokeh" background. I hadn't thought of using acetate. Definitely going to try it out! I also want to try putting some rubbing alcohol in a spritzer... another thing I have not tried. Thanks for inspiring me to try new things! WOWZA! What beautiful cards!! Love both of them so much. The Bokeh look of the first one is simply gorgeous and the softness of the second one is just so pretty. Love the "hello" card. So beautiful and full of interest. These are ALL gorgeous! I love this pretty pink color! It is really soft and feminine and it looks amazing! Both of your cards are so gorgeous! I love the first one with Bokeh effect using acetate circles!! How brilliant!!! Thanks for sharing this spritzing technique with us! I need to give it a try! The hello sentiment on the acetate gives a spotlight interest! So wonderful! Absolutely beautiful cards - so very elegant. Loved both cards. Great job with color combination. I've learned so much and really want to start my alcohol markers collection. These are works of art and I love the different techniques used to create them. My first set of alcohol markers may just be this set because of the colors and because I would like to try them on Yupo paper. Thanks for sharing gorgeous use of color. Adore the markers! Both those cards are wonderful - love soft colours, and I love all the wonderful details in the first one. Such lovely layers of colour, and texture. I love the touch of gold - very elegant! Beautiful cards, very feminine! I love the colors in this release! 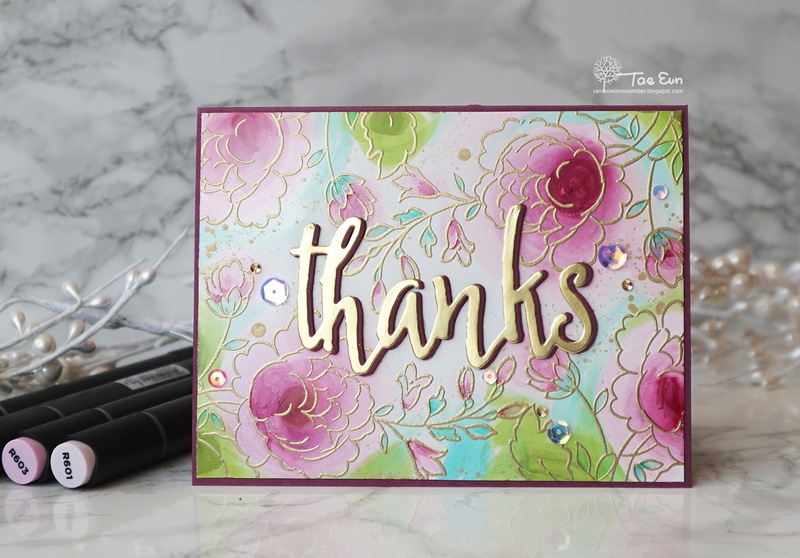 Just yesterday I was watching some videos on creating a bokeh effect, so I'm so glad to see another way to do it used on your card. Beautiful results. I also like the way you used a single stamp to create your background by applying color before stamping. Beautiful cards! Love how you created the bokeh effect! Thanks for explaining it! Pretty & dainty colors!! Lovely how the gold embossing worked well with both themes. So gorgeous! 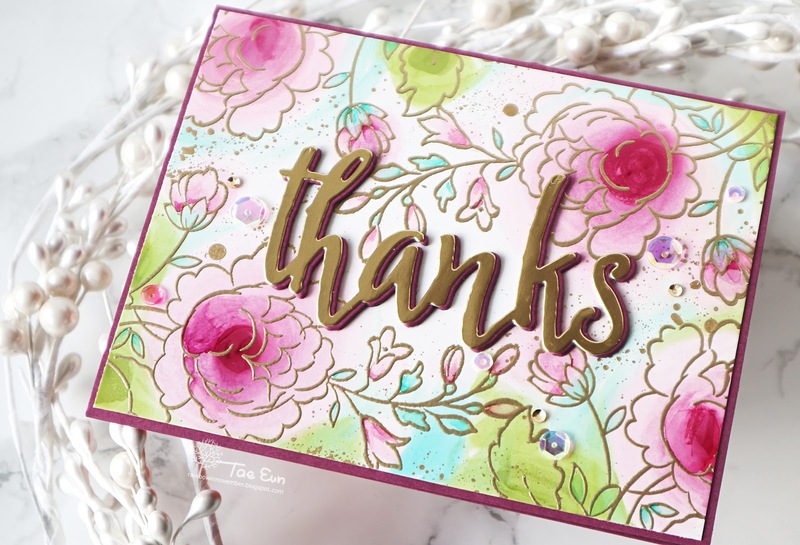 Your coloring is stunning, especially on the floral from Handpicked Bouquet and the background on that card just takes my breath away. The other card is quite lovely as well. Beautiful job! TFS! Love the look of both of your cards. Interesting how you used acetate for you bokeh background. It looks amazing!! Thanks for sharing. Wow the first background is so amazing . Oh my I like it so much And your coloring for sure is so great . All. Your cards are so pretty . The design The colors are so. Matched and unique.. Your cards are absolutely beautiful!!! I especially like the embossed acetate circle sentiment. What a great idea! Your first card is gorgeously beautiful--too pretty for adequate words. Incl. the second in that as well. Gorgeous cards. Your coloring is amazing. Wonderful new marker set from Altenew. Beautiful cards! I love the background on the first card! Both cards are just beautiful! I love the new marker colors.I was especially impressed with you r technique of adding alcohol to soften the edges of the background. 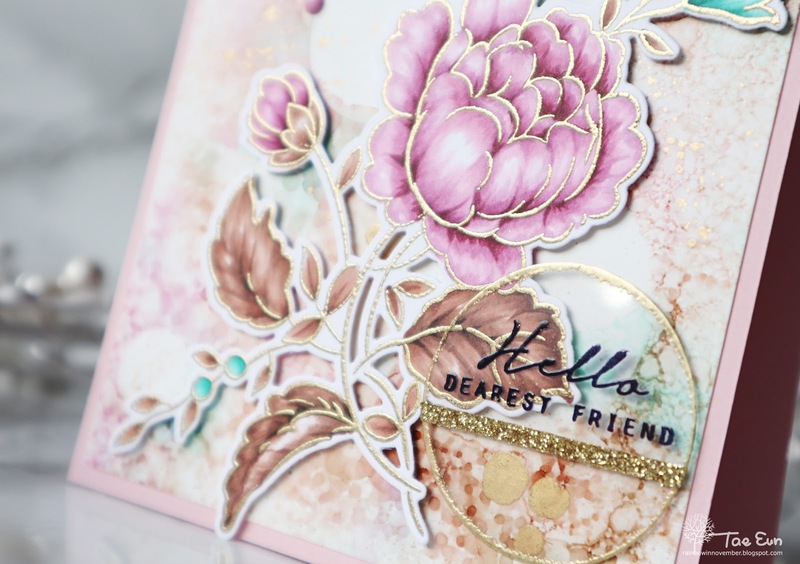 Overlaying with the gold heat embossing is gorgeous! What a gorgeous DESIGN! I love the background! And the way you colored the flowers is amazing! Such gorgeous colors! Love your cards, they are very pretty! !Thanks for the inspiration! You’ve created a stunning background,love the cards x. The first card really catches my attention, so lovely. It's great to see all the techniques and products you used for this card. Put any crafty tool in your hands and out comes awesomeness, TaeEun! LOve that you have a new toy, and we get to see all this fun stuff happening with it … unbelievably beautiful, my friend! Beautiful cards/colors! These markers sets are jewels just like the flower sets! Love the acetate circle idea - Thanks! 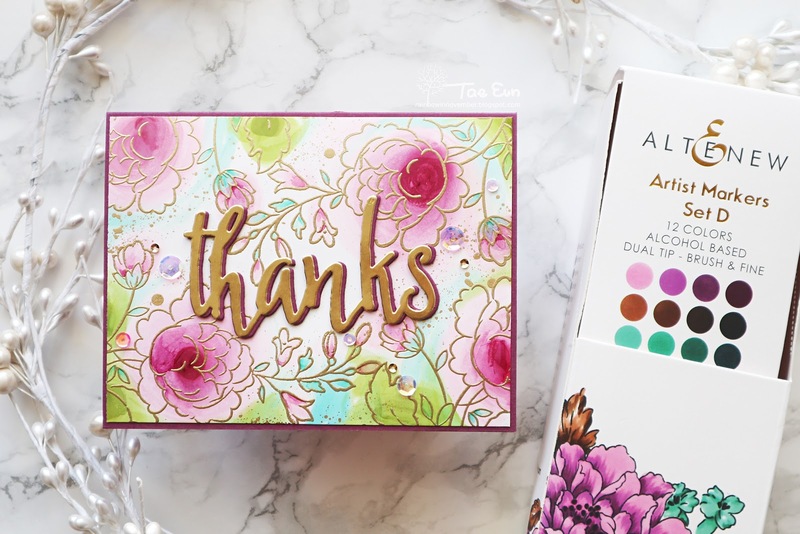 Just love the colors in this marker set and your projects are gorgeous! 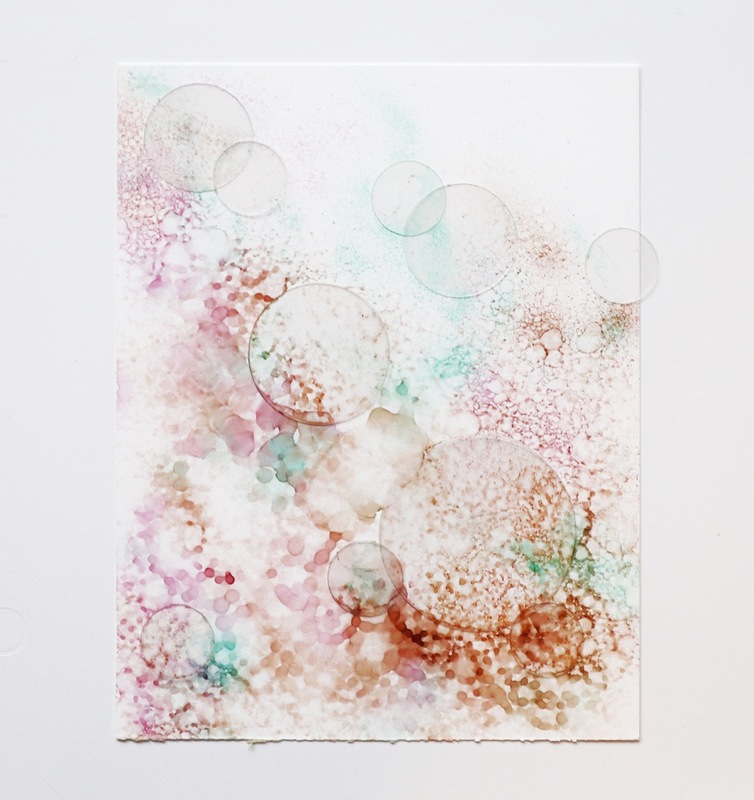 I especially love the soft look with the watercolor background in your first card. Beautiful cards! Love the colors and the background. Stunning card , amazing coloring ! TaeEun, both of your cards are so pretty! Thanks for sharing your techniques with us...I can't wait to try it myself! Your results are so beautiful!! Beautiful--I like the embossing and the colors. Utterly delightful cards. Thanks for sharing. Your cards are beautiful. Love the new colours. Both styles of card are fantastic, I'm leaning slightly more to the second one in intensity but how you created the background on the first is something I really want to try. Thank you for sharing. Wow! You have made 2 amazing cards, TaeEun! Both are so beautiful! 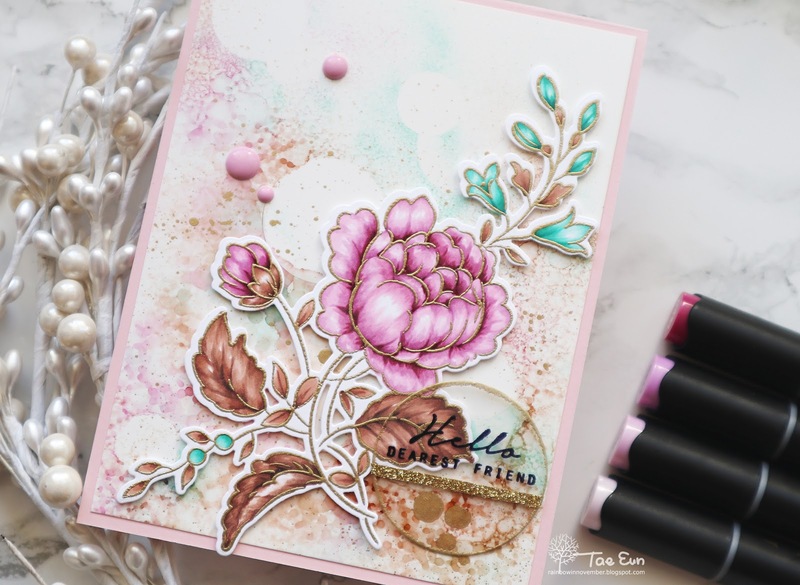 I love the first with the gorgeous background and clear acetate sentiment circle and the clever use of markers to make a soft whisper colouring on card two! Thanks so much for sharing your wonderful hints and great inspiration! Lovely cards using the new colors. I love the stamp sets you used to showcase these markers. Your coloring and blending is fabulous. I am so glad they made these markers in three Color families so it is so easy to blend. The additional of the enamel dots and sequins was the perfect touch. They look so soft and feminine. Anyone would treasure these cards if they received them. Thank you for the inspiration, it is greatly appreciated. 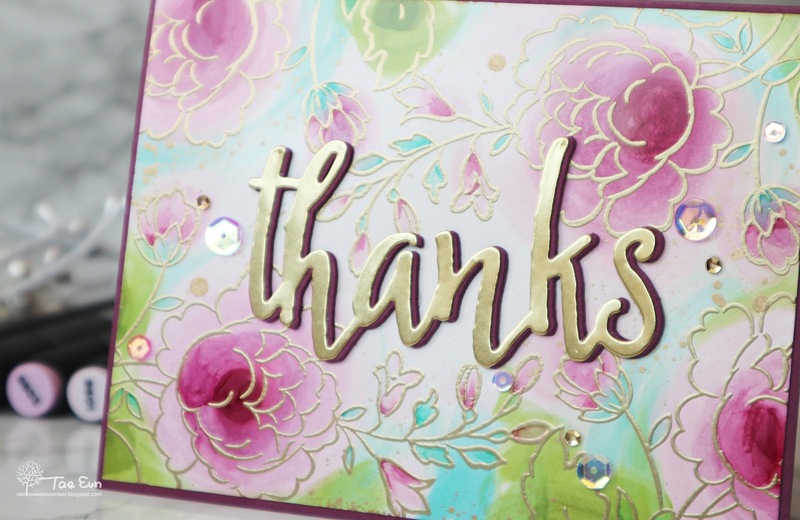 Love both of your cards, especially the second one, but that acetate sentiment circle on the first one truly intrigued me - it looks like some kind of a glass embellishment - fantastic! Your first card is absolutely stunning!! The floral cluster is colored beautifully. The bokeh background is gorgeous. And, the acetate sentiment is so creative. I love everything about this card!! Wow, I really love that bokeh effect on your first card. Just amazing. Amazing cards! Love the background of your first card! These are so stunning, especially love the background you created for the first card, its magical!!! I love the softness of the first card - the gold really gives it a lot of elegance! The second card is such a cheery and fun design - it really is so lovely, too! Thanks so much for sharing and inspiring! Aaahhh, TaeEun, each of your two cards is beautifully done!! The first one especially appeals to me. You've used a very different technique which makes it so unique & interesting to really look at in detail. Also your colouring is lovely. Thanks so much for sharing your talent. Oh my goodness, beyond glorious cards. Your talent is simply amazing. gorgeous cards, as always, TaeEun - thanks for sharing how you created the background on the first card. Love these beautiful cards. The background on the first is brilliant. Your cards are amazing, TaeEun! I hope that you can do a video on your bokeh technique for your first card, so I can watch how you did this! Stunning! You showed off the new colors fantastically! Your cards are always so exquisitely gorgeous! your attention to color and detail amazes me! They are truly works of he(art)!!! Your cards are absolutely beautiful!! I would love to see videos of your amazing process! Such talent! Thank you for the inspiration! What gorgeous cards! I especially love the first one, the colors are so soft and muted, it makes the flowers look really delicate! I love how you created the bokeh background too! I forget that I have that tool and forget to use it! Thanks for the reminder and great inspiration! Gorgeous! I am intrigued by your first card and am dying to try that technique. Beautiful cards! Such gorgeous colors, details, and design. I love embossing! Gorgeous cards! I love how you created the background and the sentiment on the first one. It shows off the focal images beautifully. Wow what amazing colouring! Love the spritzing technique and the sentiment on acetate on the first card! Both are stunning cards! Your tips of spraying rubbing alcohol & how to make a bokeh background are helpful to me too. Thanks for including things that will help me. Making that background on the first card was above and beyond, TaeEun. Simply gorgeous!! Your card is out of this world!! Really like the soft colors... It looks so elegant! Both cards are gorgeous! I love the soft colors of the first card and the bokeh background is stunning. The second card is more vibrant but still quite feminine. The gold embossing looks really pretty! Gorgeous cards! 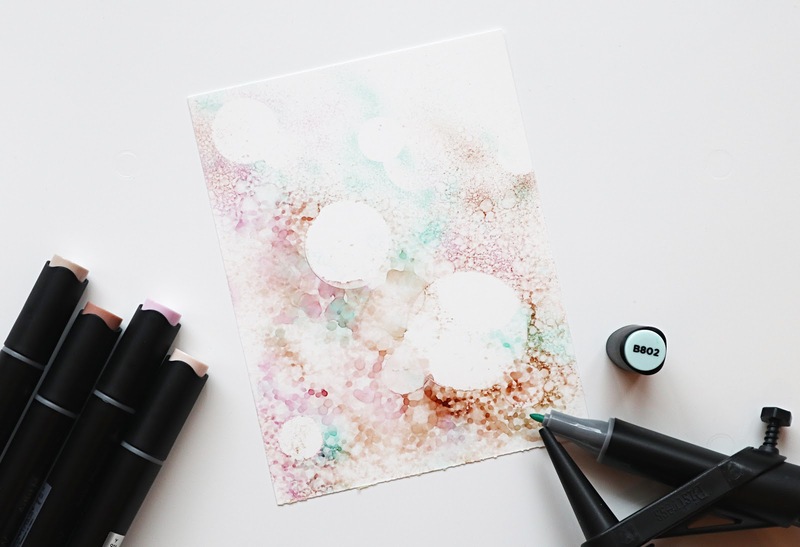 I love your colour combinations and the backgrounds are beautiful! Your cards look great. That first one is gorgeous. With that color combo and brown leaves it has a very appealing vintage vibe. I would have loved to see a video on making that background. I haven't used my spritzer in a really long time. You've made an incredible looking background for those gorgeous florals. Stunning cards! I love the background of the firs card. And the colors! Your cards are just beautiful! Love all the gold. I love the techniques you used. The background of that first card is amazing! The second card is so lovely. The softness makes it so beautiful. Thanks so much for the inspiration! Love your use of color. These are just stunning! Wonderful work!